To get a first overview of which topics within sustainable development that are relevant for the organisation and its stakeholders. In this template workshop, the facilitator guides the group through a materiality analysis. 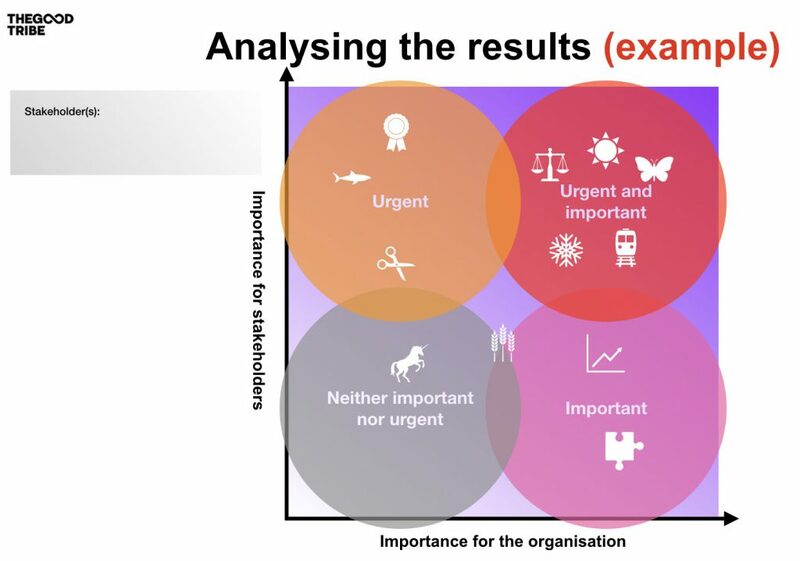 The purpose of the materiality analysis is to help companies determine which sustainable development topics are of greatest importance to the own organisation, as well as key stakeholders. The materiality analysis can be used to shape strategies or to define key performance indicators and impact measures. This workshop focuses on the foremost, to shape strategies. The results of the workshop can, e.g. be used to create a vision, a strategy, to set goals and develop new products and services. This workshop is a first step to get an overview of which topics within sustainable development are relevant for the organisation and its stakeholders. The next task after this workshop is finished, would be in-depth work with the materiality analysis based on business intelligence regarding the respective stakeholders. The workshop can be held internally in one organisation, or with a mix of people from different organisations. The facilitator will need to change the workshop outline accordingly. Facilitating this session does not require any special certification. However, you need a proper understanding of the domain of sustainable development and the concept of materiality analysis to effectively support your group in conducting the main exercise of the session. The materiality analysis in itself is rather straightforward. However, what can be challenging is helping, especially a client with little or no experience working with sustainable development, as it’s a highly complex topic. If the client’s experience and/or knowledge of sustainable development is low, an alternative start to their work is to conduct a life-cycle-analysis. When preparing the workshop you need to formulate a focus question, which will be the theme of the workshop. You also need to decide which type of materiality analysis that suits the purpose of the workshop, as well as define the factors or parameters of the analysis. The focus question and the type of materiality analysis should be clearly communicated in the workshop invitation and introduction (I DO ART) so that the purpose of the workshop is clear to everyone. Overall, the higher quality business intelligence or even scientific data used throughout the process, the more relevant the outcome of the process will be. A materiality analysis is used to filter out the most relevant or “material” topics. There are several types of materiality analysis. Below you find two types that are used in the domain of sustainable development in general, and more specifically in a Global Reporting Initiative (GRI) context. The types presented below are used primarily for strategy formation. Other types of materiality analysis can be used, e.g. to filter out impact measurements and key performance indicators (KPIs). Focuses on the importance of various topics to external and internal stakeholders. Why? How can we better serve our stakeholders’ needs? Are we missing out on opportunities? Why? How can we educate our stakeholders? How can we shift focus to better serve our customers? Why? Are we missing out? Risks? Focuses on the impacts on the organisation and its ability or opportunity to influence or control them. Why? Risks? How can we challenge the status quo? Why? Are we missing out? Potential competitive advantage? Why? Are we missing out? How can we create a most attractive sustainable development strategy / CSR initiative / sustainable business model? How can we prepare the transition from “business as usual” / conventional business to “business for good” / sustainable business? How can we identify blind spots / risks in how we’re perceived by our stakeholders? What topics must we address as we define / redefine a sustainable development strategy? What sustainable development topics are crucial to address as we define / redefine our product or service portfolio? 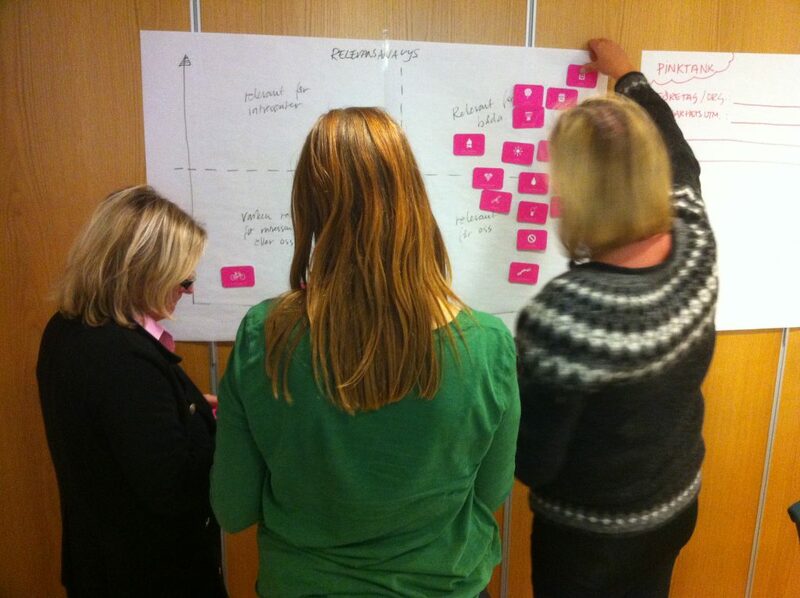 How can we map out relevant key performance indicators / impact measures? Depending on the type of materiality analysis that you choose it can be helpful to define relevant internal and external stakeholders to address in the analysis already before the workshop. If this is not an option, ask the participants to limit their discussions to one or a few selected stakeholders. When facilitating a materiality analysis, you need a set of factors or parameters that you can move along the Y and X axis of the graph to define their relevance. These factors should be determined by the facilitators and/or the client well before the workshop. For a broad set of sustainable development factors or parameters you can use MethodKit for Sustainable Development, topics from the GRI reporting metric, the UN Global Sustainable Development Goals (SDGs) or other carefully selected issues. The factors or parameters should be prepared before the workshop. E.g. printed on cards, which can quickly and easily be moved by hand along the Y and X axis). Leave blank cards for the participants to fill in. Also, use post-its to attach specific and ideas to different cards. Evelina Lundqvist (1981) is a social business consultant and an award-winning social entrepreneur. She runs her creativity and sustainability agency, The Good Tribe out of Sweden and Austria. Evelina’s mission is to create change at the intersection of sustainable development and creativity. Along the way she builds communities, raises awareness and empowers people and organisations to take a leap from “business as usual” to “business for good”. 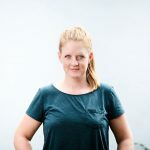 She works together with clients such as IKEA and Caritas and the municipalities of Östersund, Stockholm, Botkyrka and Graz. Moreover, Evelina has co-founded numerous social entrepreneurial ventures over the years. As Evelina is currently taking a stronger interest in human rights and democracy, her latest venture is Antirumours Sweden. Evelina holds an MBA in Business Ethics and Corporate Responsibility from Danube Business School.